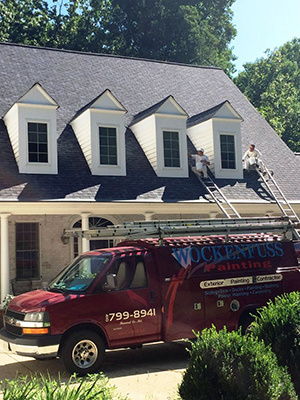 Wockenfuss Painting is your complete exterior painting contractor serving all of Howard County Maryland with a list of services that includes much more than painting the exterior of your home. We pay attention to every detail of prepping the exterior of a home for a top quality painting or staining project that will look great for years to come. Wockenfuss Painting can restore the exterior of your home to new condition. Dave Wockenfuss painted the exterior of our single family home. He also painted and installed new wooden steps that lead to the exterior entrance to the basement. "Wonderfully. David, Francisco and the crew did a fantastic job painting the cedar siding and soffit of our house. They arrived on time, did their work efficiently, and cleaned up when they left. This is without question the best painting team I've hired at this house. From the day he returned my phone call, David has been a true professional. He came by, asked me what I was looking for, then looked over the entire property, made some recommendations, and then emailed me a complete estimate. He was a pleasure to work with. In this instance, I was looking for someone who knew how to paint/stain cedar siding. That is one of David's specialties. But he also does interiors, which is good to know for the future. If you're looking for a paint crew for exterior or interior work you won't do better than Dave Wockenfuss. He's a straight shooter. He does what he says he's going to do. His pricing was reasonable, considering he was painting the entire exterior of the house and installing treated wood boards to each of the fourteen steps that lead to my basement. The work was excellent. The price was right. I couldn't be happier!" 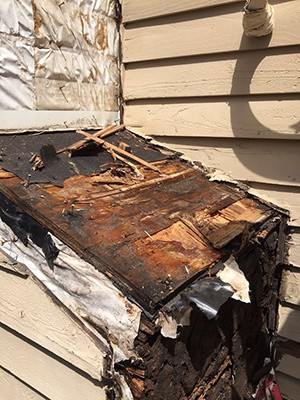 Photos below show some of the damage we discover on exterior of homes. 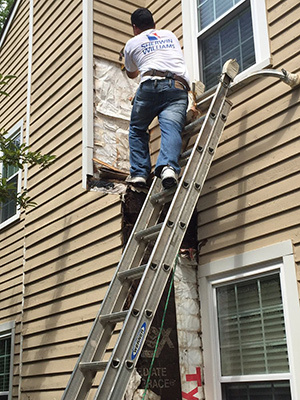 Wockenfuss Exterior Painting experts will repair and fix these issues. Power washed entire house. Scraped and caulked. Painted entire house base color with two trim colors. "Working with Wockenfuss Painting Company was a very positive experience. Dave Wockenfuss worked with us during our renovation by coming to the house several times and providing written estimates as our needs changed. After we chose our colors for the house he offered suggestions and helped us finalize our color scheme. After discussing our project with several painting companies, we contracted with Wockenfuss Painting Company understanding that weather played a big role in scheduling and that we had a number of jobs ahead of us. When our turn finally came, the crew came out and power washed the entire house. They then scraped and caulked the areas that needed it. The following day the painting crew showed up and went right to work. They were very diligent and seemed to take pride in their work. They were always courteous and polite to my wife and I. Dave Wockenfuss was on sight each day overseeing the work and touching base with us which impressed my wife and I (a lot of times in our experience the contractor disappeared after the initial start of a job). A couple more days and the whole house was painted our base color with two different trim colors. Dave and his crew were very professional and did a wonderful job changing our poor diamond in the ruff into the jewel of the neighborhood. We would certainly consider them again for our painting needs."